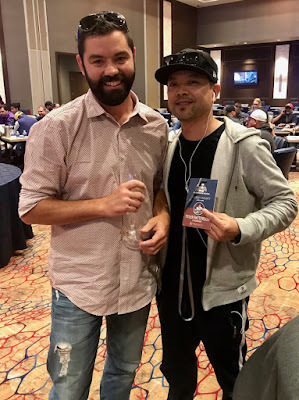 Celebrity Bounty @TylerPoker Patterson moves all in holding a full house and needs to avoid only a 9 on the river from Ryan Pham who can draw out to a bigger boat. The entire table starts chanting, "Nine Ball," really really REALLY loud. That was quiet, however, in comparison to when the Nine Ball actually hit on the river .... Pham captures the bounty, $300 cash and $200 to the Thunder Valley Spa as his Grand Opening Celebrity Bounty prize.